... that didn't turn out good!! Lols! Yay! We are reading Malayalam books too!!! To our amazement, she is developing an eye towards "handling everything at home"... All praises to Lord! Every morning she checks if the dustbin is full, she takes the bin bag out very carefully, and keep outside main door and go back a inserts another fresh bag in the bin. The charming thing is that, one day I found the dustbin all clean early in the morning and thought J must have done that. It was quite surprising to know that he didn't do it. And the "doer" came with a happy face and we were just proud to see her glowing face and gleaming eyes..:) So cute! Very often, both J and I get scolded by her for not "doing things as it suppose to be" sometimes she advices us "Momma you should not do it like that, I 'll show you" or "Pappa, you don't know how to do that".. In such instances, her face turns into a serious mode with frowned eyes and we won't even get a smile for a moment... The bliss of parenthood!!! Thank God! She loves her schools, loves Ms A and Ms S. Fond of her cute little friends. She continues to do "role plays" in the second half of the day (after schools and when momma gets busy with work). I really can not think when she started to make imaginary friends, but more than 1.5 years definitely. I will have to dig my older posts to see. But the interesting thing is that she is never tired of. Sometimes, I go mad when she ask me to advice to Dora/Minnie or to some school friends. Imagine myself advising all those imaginary characters sitting in her play room. Not even dolls but purely imaginary. Sometimes, I am asked to teach them shapes, or clean their pee/poo, or even feed them!! Lol!! She wants to be bold and strong girl when she grows up. She can try anything if she is said that that will make her bold/strong. 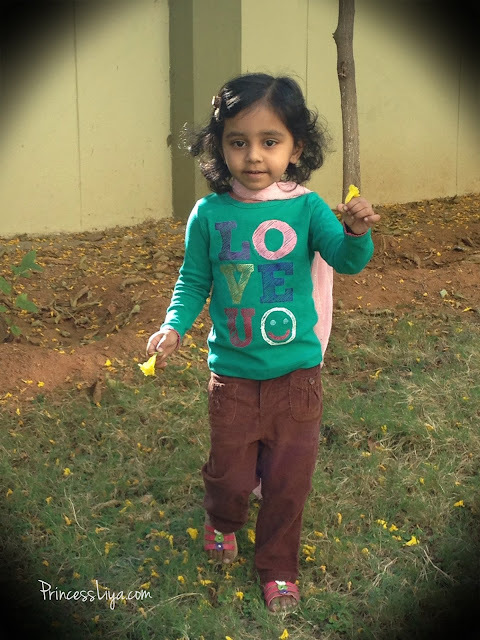 For example, when she went for vaccination (there are some special ones in India, which were not given in the US it seems..;)), she was given three pricks on her two thighs. The nurse, J and I were totally stunned to see her calmly laying down and suppressing the pain. After three consecutive pricks the nurse told me "Never in my life I have seen a kid like this.." The motivator was that before stepping to vaccination room we had told her "bold girls won't cry if they get a prick". Project 365 :: Day 11 :: 3 years and 3 months today! Yummy evening snack today- Home grown plantains roasted with ghee and egg! Project 365 :: Day 2 : The First Star of the year! 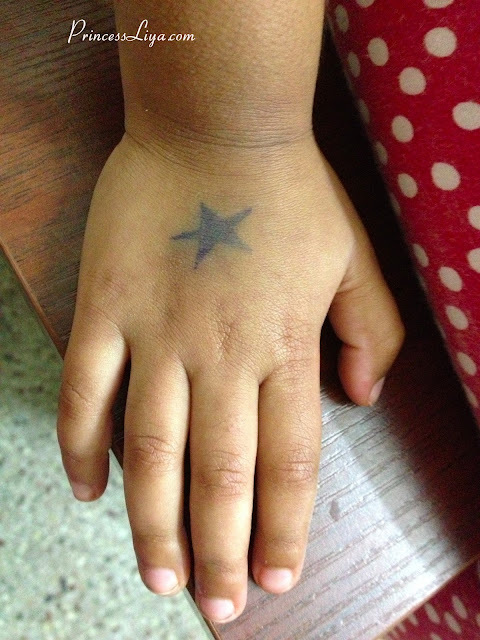 2nd Jan 2013- The very first day of school in the new year, L came home with a really BIG star on her right hand. So proud!! 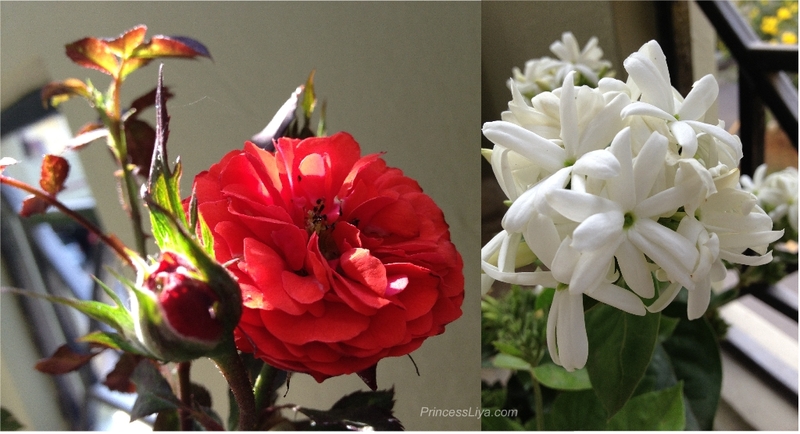 On the first day of the new year, Liya is the proud owner of two flower pots at her mini garden. Inspired by Foz, I am gonna give a try with Project 365. The project is all about "A photo a day, every day for a Year". Well, I won't be able to post it everyday... May be I will club a week's photos and post it or "as in when time permits". Let me see if I am gonna succeed. Challenge!! !